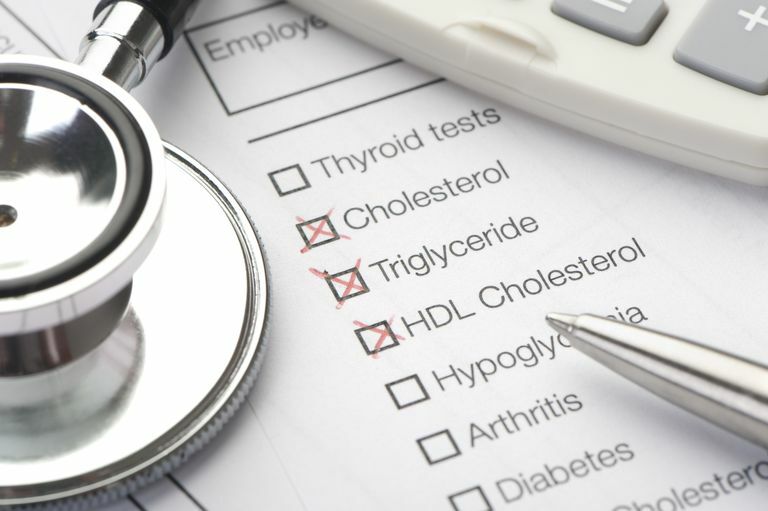 High triglycerides – especially when coupled with high LDL cholesterol (also known as "bad" cholesterol) – might place you at risk of having heart disease, but what are they? Triglycerides are a type of fat, or lipid, that accounts for the majority of fat in our diets. Triglycerides are important because they provide the body the energy it needs to function on a daily basis. If you have an excess of triglycerides in the body, they will usually be stored as fat. Triglycerides are either made in the liver or consumed in the diet and then absorbed into the body through the small intestine. Additionally, triglycerides never travel to their destination in the body alone. They attach to a protein and become a lipoprotein referred to as a chylomicron or a very low-density lipoprotein (VLDL). These lipoproteins are not very dense, or heavy. Therefore, along with low-density lipoproteins (LDL), they run the risk of potentially contributing to heart disease. What Should My Triglyceride Levels Be? Triglyceride levels should be below 150 mg/dL (1.69 mmol/L). Levels between 150 mg/dL (1.69 mmol/L ) and 199 mg/dL (2.25 mmol/L) are considered borderline high. Levels between 200-499 mg/dL (2.26-5.63 mmol/L) are considered high. Levels above 500 mg/dL (5.64 mmol/L) are considered extremely high. Who Is at Risk for Acquiring High Triglyceride Levels? If any of these risk factors are present, your healthcare provider probably will recommend that you have a lipid panel performed more frequently (every one or two years as opposed to five years). What Can Happen If My Triglyceride Levels Are Too High? Having high triglyceride levels may place you at risk for coronary heart disease. However, this fact has not been exclusively proven. When triglyceride levels are high, most often, LDL levels will be high as well. Elevated LDL levels are an important risk factor for heart disease. However, it has not been fully established that high triglyceride levels alone are capable of producing health disease. While there are some studies that have stated that high triglycerides alone are not an independent risk factor for heart disease, there have been other studies that have indicated that triglycerides alone, even with normal LDL and HDL levels, can cause the development of coronary heart disease. Even though the verdict is still out on whether or not high triglyceride levels alone can cause heart disease, it is still important to restore them back to their normal levels. High triglyceride levels are initially treated with a low-fat, low-carbohydrate diet and lifestyle modifications. When this does not work, your health care provider may want to add medication to help lower your triglyceride levels.